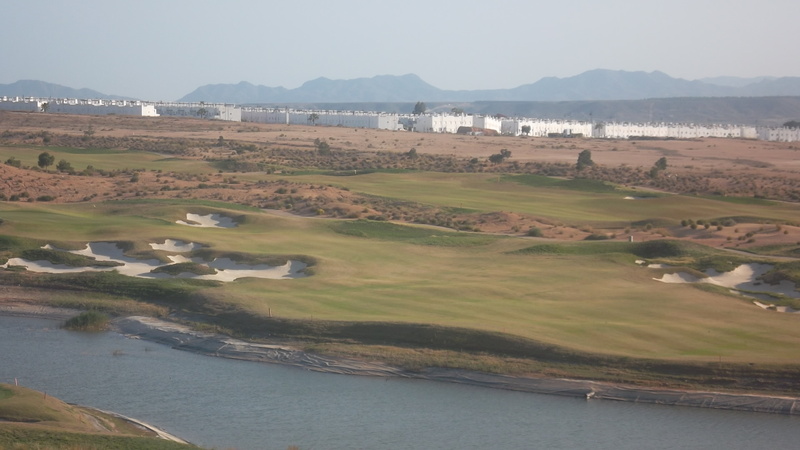 the trees and mountains make a lovely backdrop to the first hole………. 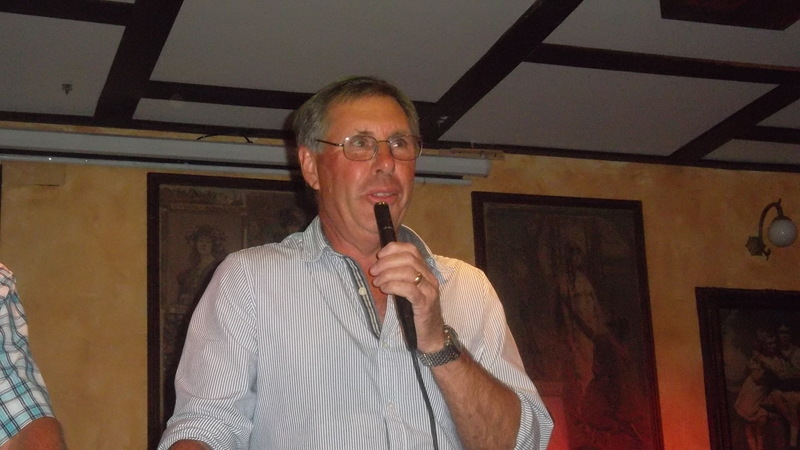 Paul makes his final speech as captain……..
54 players this week in the waltz, a lovely sunny day in Spain, athough we were faced with an unusual diagonal wind (not behind or against as usual), which made shot execution a little more tricky. The scoring was not as low as expected, but it was nice to see a change of winners with the residents pushed into the minor placings. 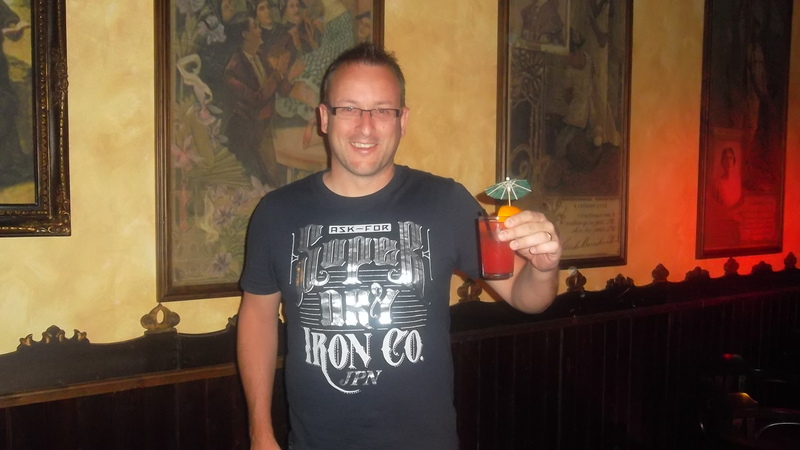 Ricky, Chris, and the two Geoffs were this weeks winners…………. 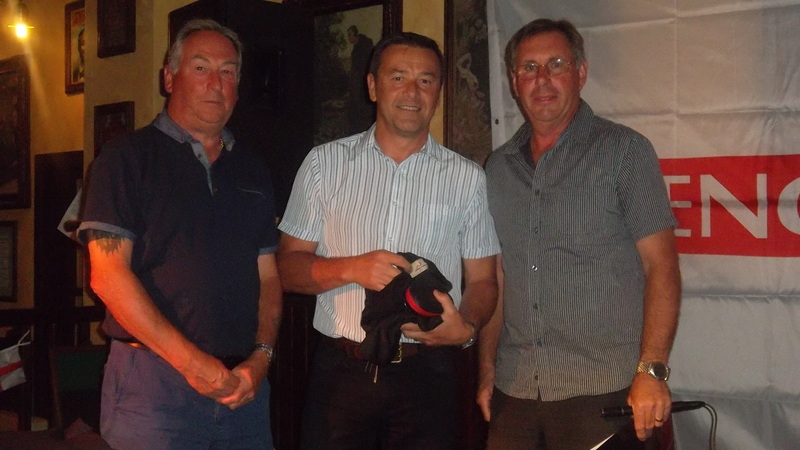 This week was the final public appearance for this years captain, Paul Briggs. Paul returns to the UK on a permanent basis in the next couple of weeks, and we thank him for his commitment to the society over the past two years. 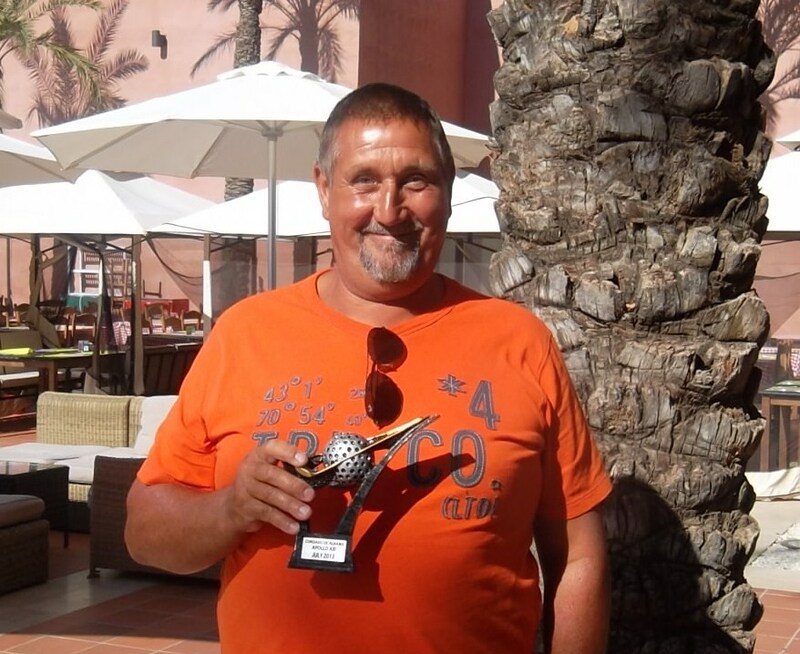 He plays well to a single figure handicap, and has often been in the winners circle, the highlight being his victory in the seniors major trophy last October. We wish him all the best in this new chapter of his life and hope to see him again on visits to Condado. 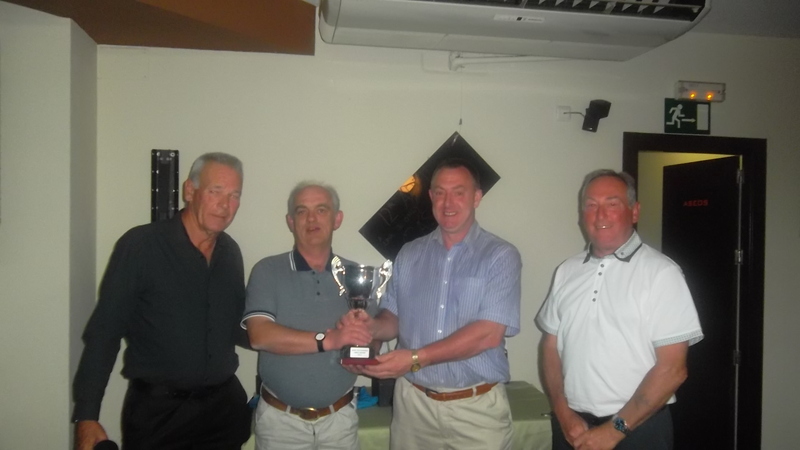 Paul with the seniors trophy……..
Next week is the monthly Apollo Air trophy, which will be a bogey for a change. Some love it, some hate it! 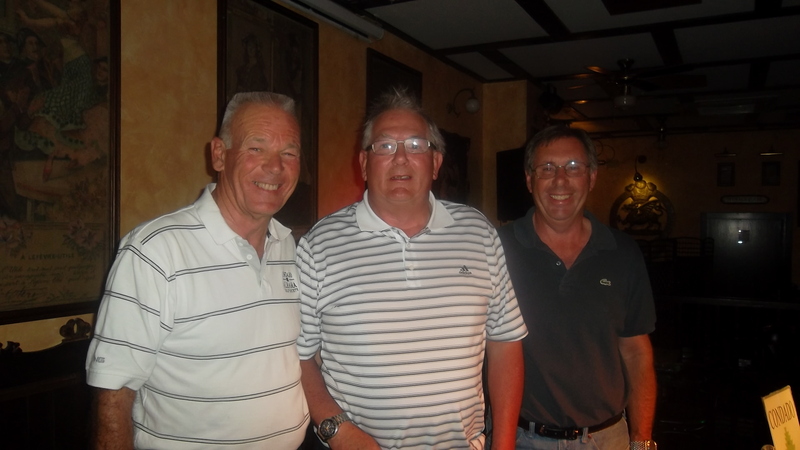 Featured golfer – this week it is Les Hurren. It seems a waste of time to introduce him as he wins every other week – but the old boy is 60 this weekend and it must be downhill from now on! Les is always happy – except when Man U lose…… he has been so miserable the last 9 months……. is actually the beginning of the next group of three. 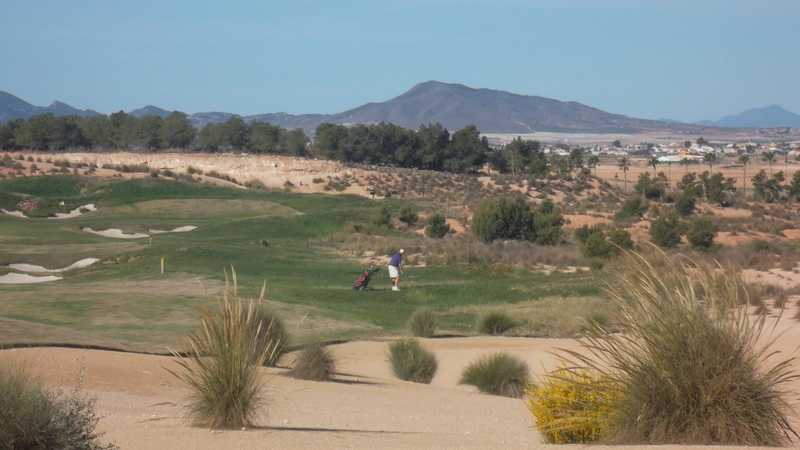 59 players played in typical Condado weather, sunshine and wind increasing as the day progressed. Plenty of red and white to be seen, and lots of scores in the red! 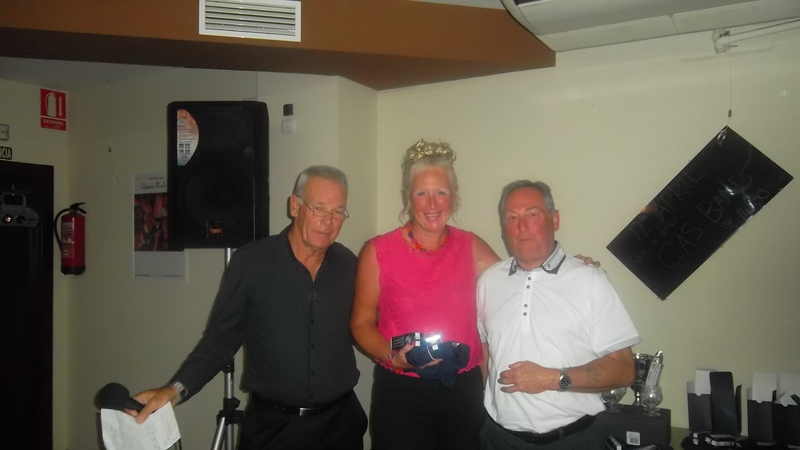 38 points was enough to take the trophy for our secretary, Barbara Rollett, beating 2 others on a scorecard countback. 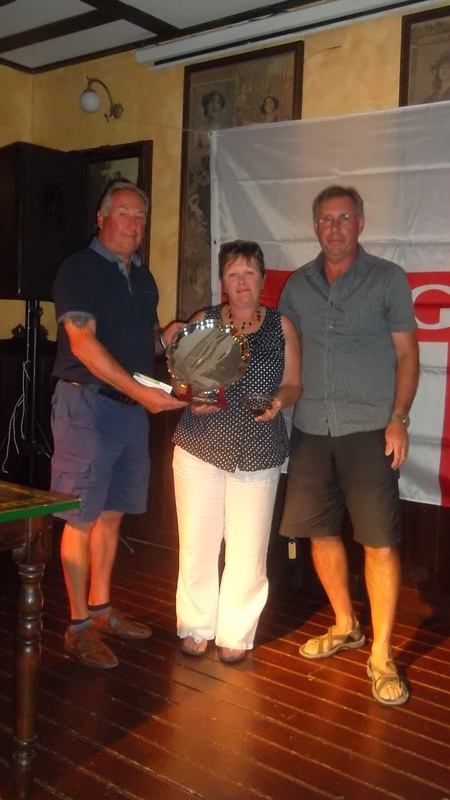 Barbara gets her trophy from vice-captain Dave (also hubby!) 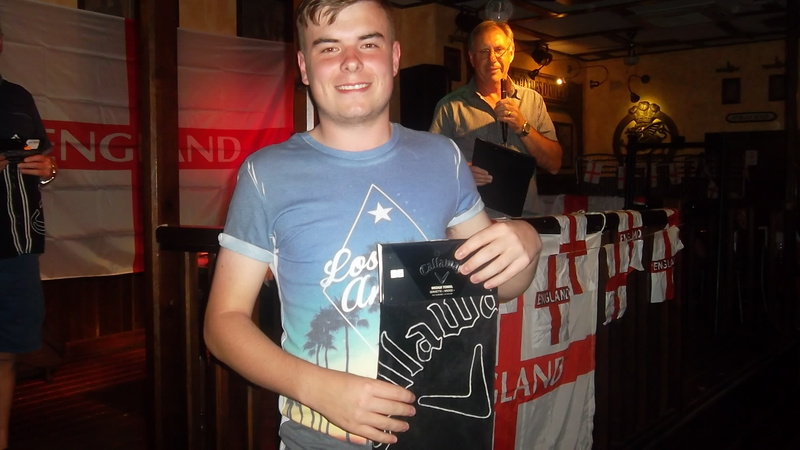 and captain Paul…..
1st div winner and best front nine for Adam………. 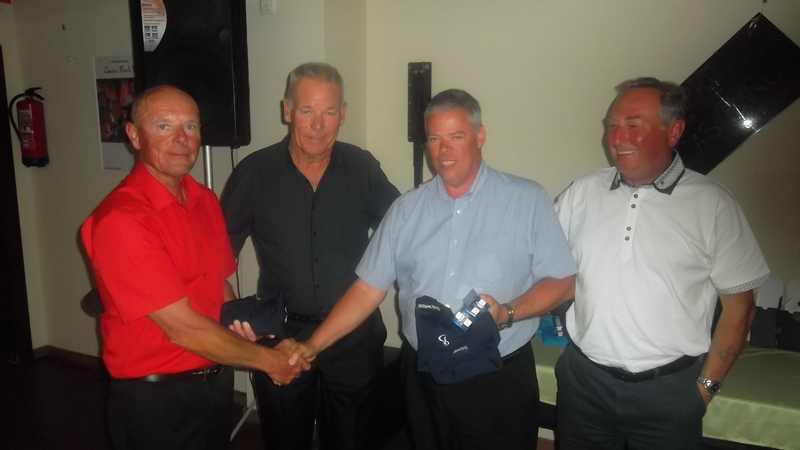 Jeff won the 2nd division……. 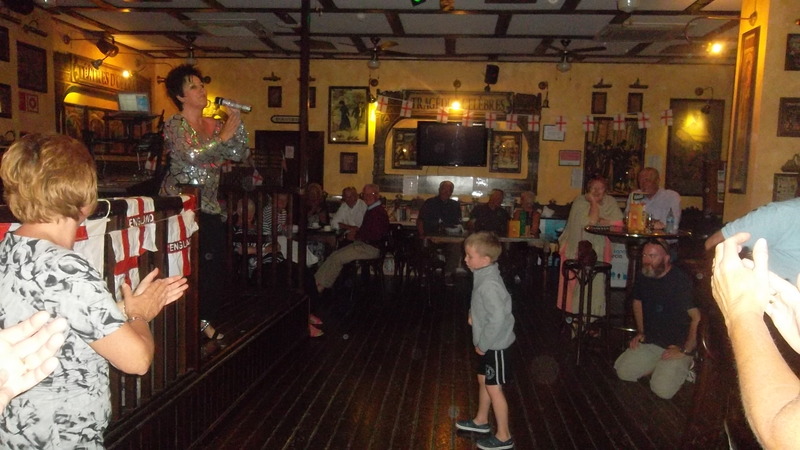 The presentation took place in the evening in the Clover, with a good turnout to watch a fabulous female singer (Dee from Doncaster). 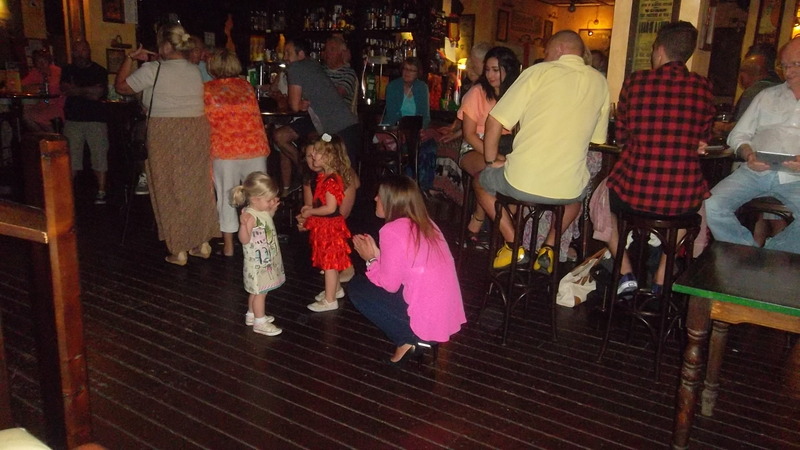 Dee with a young break dancer…..
a young set of dancers tonight……. it wasn’t just the young kids who had a great time……. Next week is the captain’s farewell competition ( a 4 person 1,2,3 waltz) – there are a few places left so get your name down now! 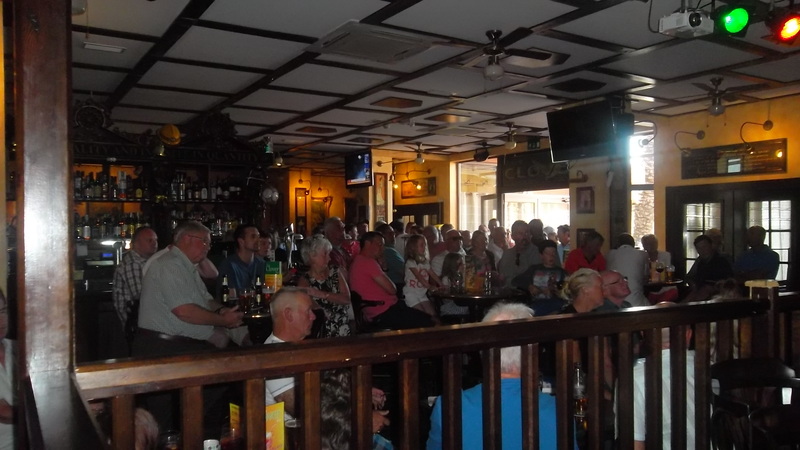 Lots of people in the Clover for the presentation…….. This week we had 18 teams, and being easter weekend, the sheet was full with 72 players for the texas scramble. The weather was again warm and sunny, with the wind increasing as the day progressed. 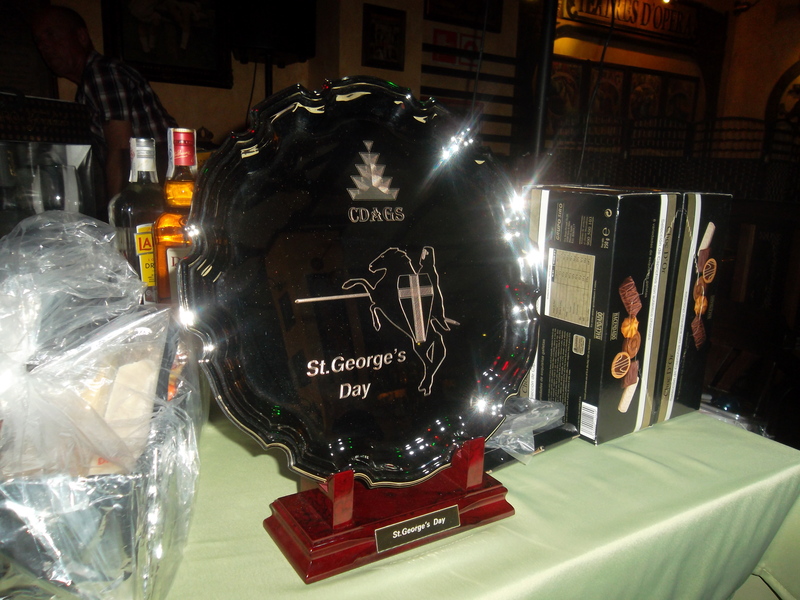 Owen, Jim, Fran and Paul had a great score…..
Next wednesday we have the St. George’s day individual stableford which is sponsored by Trophy Box. Following that on the Friday it will be the captain’s farewell competition (this will be a 4 1,2,3 waltz). Paul Briggs is not only completing his stint as captain, but will shortly be returning to the UK to live on a permanent basis. So come along and support him and say goodbye. The course will be closed at the end of May for its twice yearly hollow tining program, but we are arranging an away day for the Friday. We will go to Saurines where players will get the same rates as at Condado. 52 slots will be available and we may be organising a bus. Following the game players will get a drink and a sandwich for 5 euros. 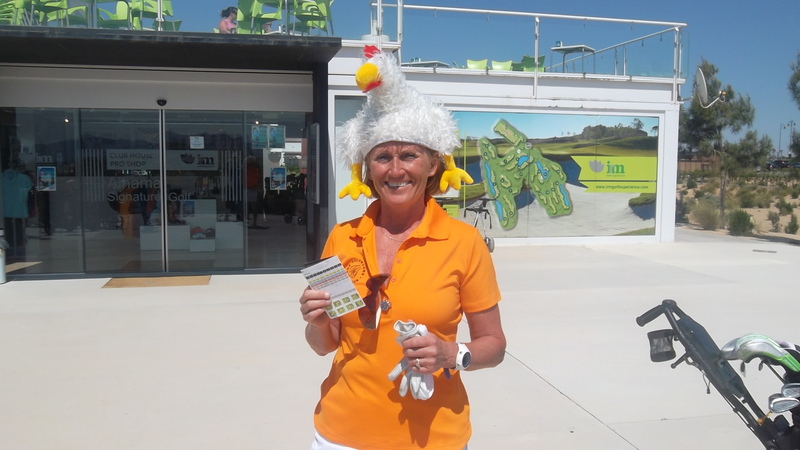 This week’s featured golfer is Kristin Skjold who is from Bergen in Norway. She certainly got into the spirit of easter this week! The joke this week………It’s not you this week Peter! (unless you have a strimmer). Apologies to anyone who is offended by additional videos which I did not want to post, but could not delete. Golf is confusing! You hit down to make the ball go up. You swing left and the ball goes right. The lowest score wins. And on top of that, the winner buys the drinks! 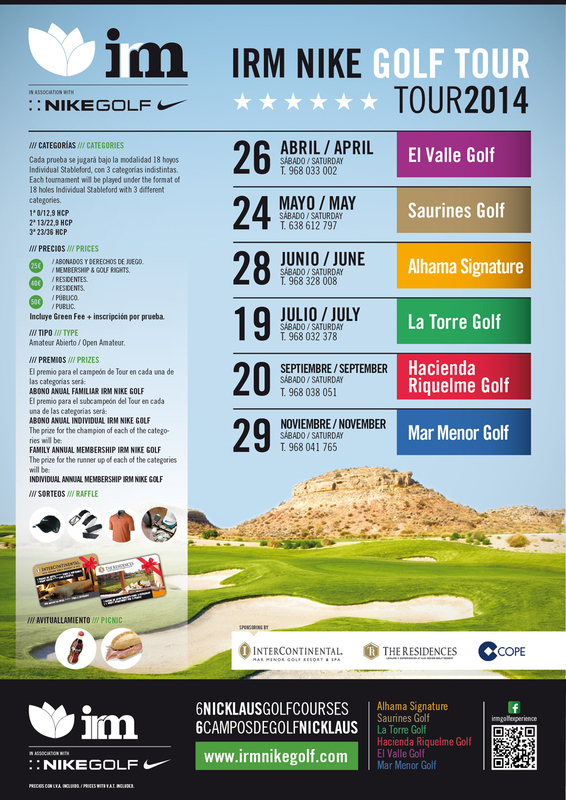 Below is an option for society members……………………..
By Pepa III tournament Lorca Golf Resort. This prestigious sponsor trust us again to celebrate the III By Pepa Tournament! Pic-nic with spanish ham and tasting of By Pepa products in the middle of the round. Lunch at the end of the round for all the participants! Report of St Georges day during the week. An unusual start for the 52 players, with cloud cover and no wind, but the wind got up as usual as the early starters were just finishing their rounds. We had a few spots of rain which did not develop into anything more. The fairways are definitely showing the new growth of green grass, and it should be perfect by May. The greens were fast, but putting was made more difficult by strategic placing of the pins – it was nice to see them in different positions. Also the 11th over water has lately seen the tee forward with the flag at the bottom of the green, making it more accessible to the shorter hitter but still presenting a different challenge. 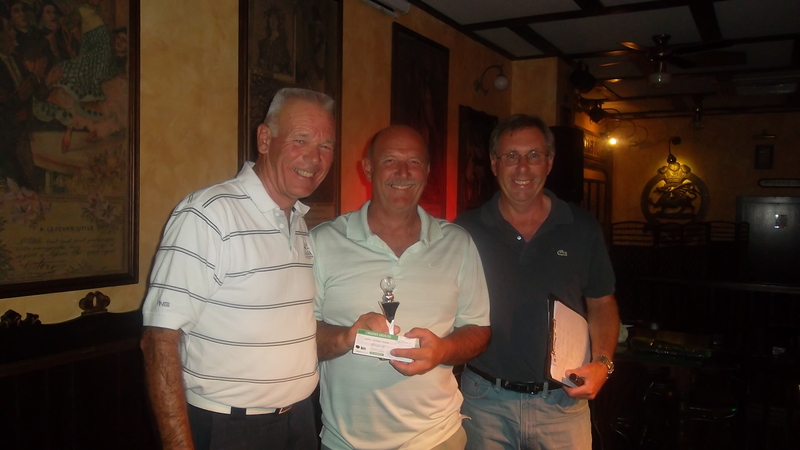 Dave Lloyd won the trophy for the second time with a fantastic score of 43 points off 4 handicap. with his gross being one under 71. A fantastic performance! Another highlight of the day was Stephen Brown’s 2 on the par 4 second hole! Worthy of a photograph I think! 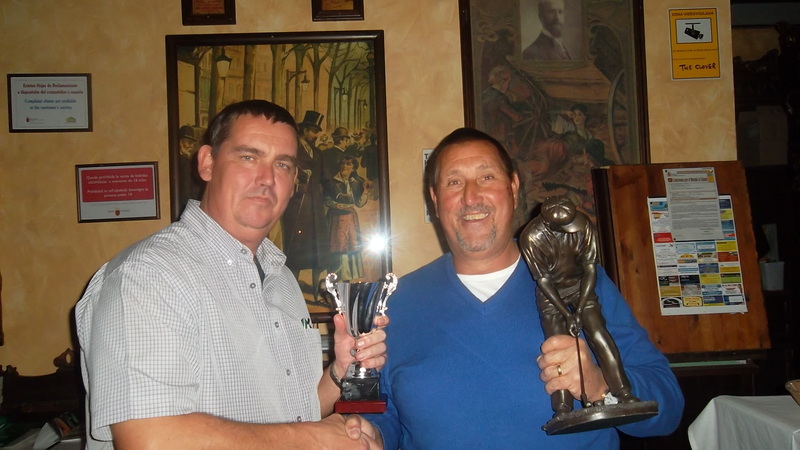 Barry was the 1st division winner……..
Jason won the 2nd division…….. There was a special presentation which was part of last week’s major event. 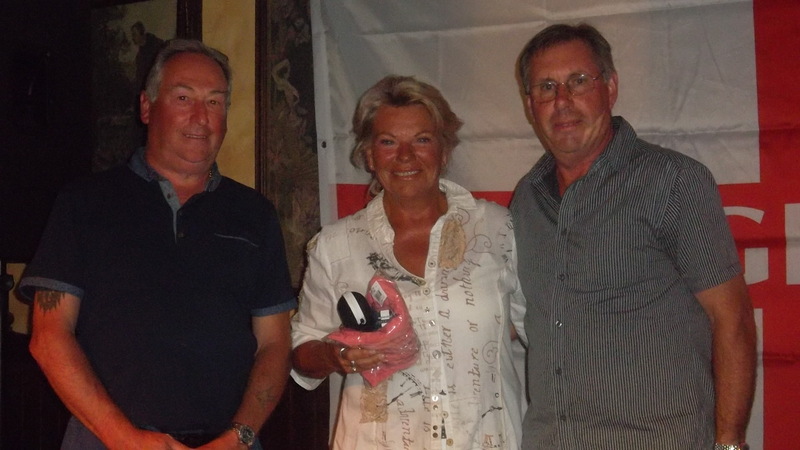 Jan and Lis Jakobsen took 2nd place, and got a lovely crystal brandy glass each as a momento, with Lis also winning the ladies longest drive. They did attend the presentation, but with the time taken to serve the meals before the presentation delaying events, they were unable to stay. Well done to both. Next week is a 4 person texas scramble, but check your times on Thursday as sometimes slight alterations need to be made on the wednesday night roll-up. 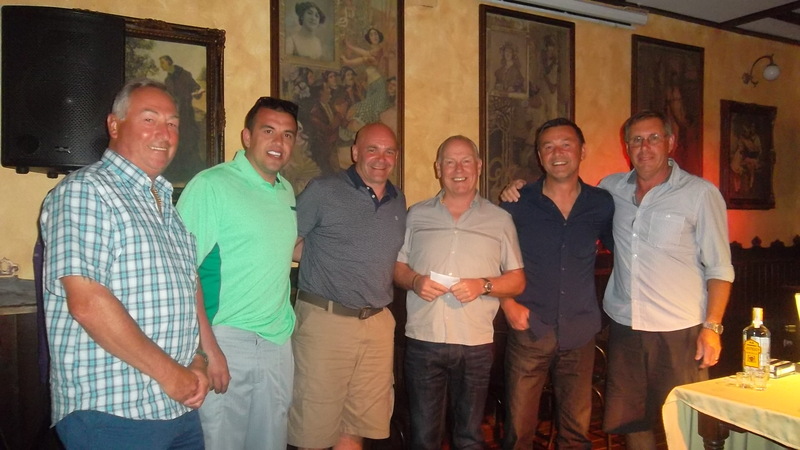 The monthly member’s draw for April was made and it was won by Michael Gavin (number 87) – please claim your voucher to barry@cdagolf.com by May 11th. The next major is on May 9th, and is our annual charity day. Again this year our nominated charity is our own CPR which is now operational and provides valuable assistance to residents in case of sudden illness or accident. 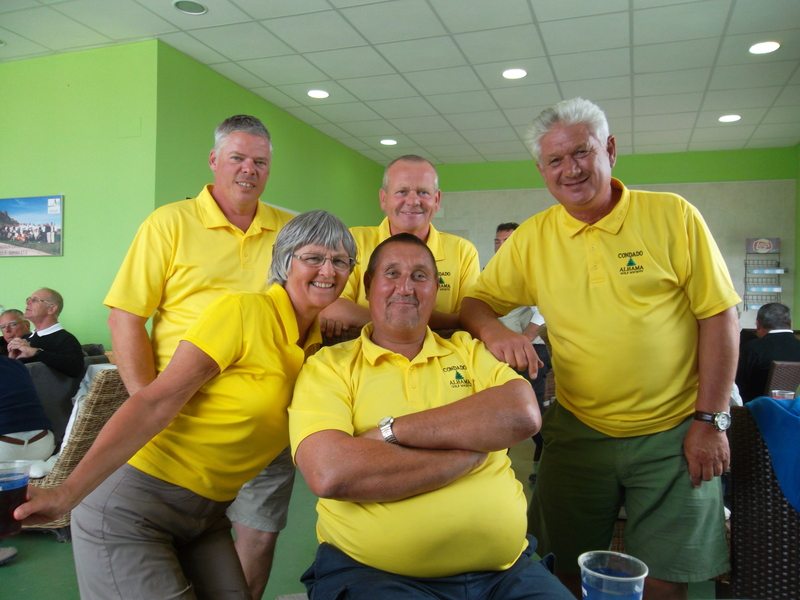 We are looking for sponsors for this event, so if you can contribute (for example each hole can be sponsored, with your details on display for 20 euros) please contact Alicia at aliciasaunders@aol.com. 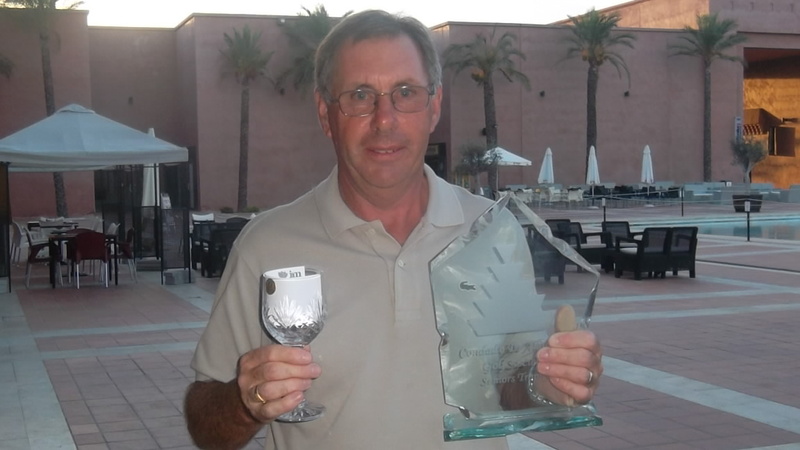 This week Owen Moore is our featured golfer – the Irishman was again in the prizes this week. 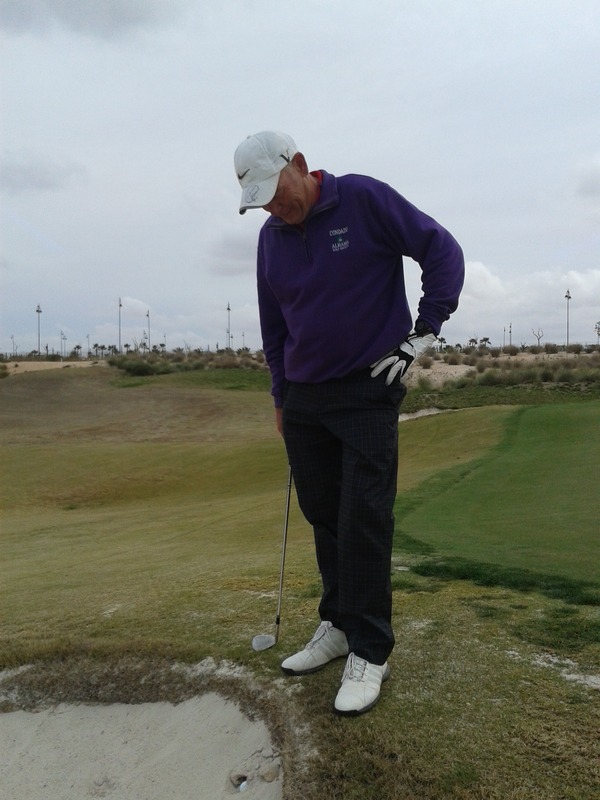 I am the boss in my house…..
Peter Reeves had a lifelong ambition to play the 11th hole at Condado de Alhama from the pro’s tee, exactly the way the pros do it. The pros drive the ball over 200 yards onto the small green that is surrounded by water. It was something that Peter had occasionally tried without success. His ball had always fallen short, into the water. Last week he decided to try again. When he came to the fateful hole, he teed up an old, cut ball as usual, and said a silent prayer. Peter complied, with some slight misgivings, despite the fact that this same force seemed to be implying that he was going to finally achieve his lifelong ambition. 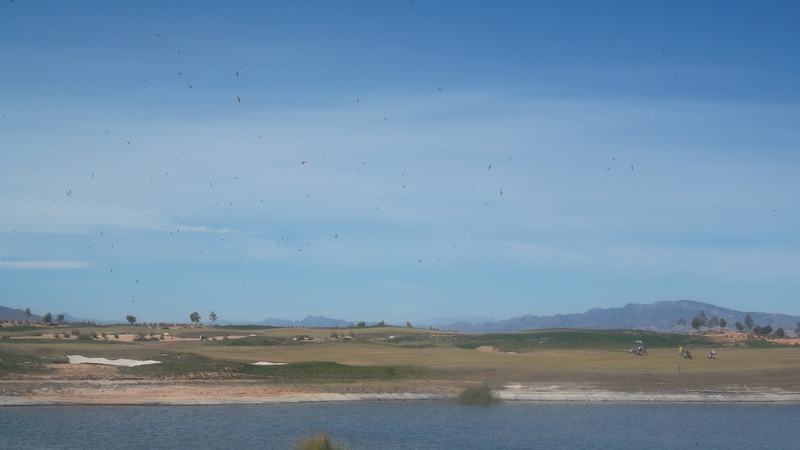 If you look carefully at the photo below (or zoom in)you will see that hundreds of swifts have arrived at Condado, and are seen here circling and swooping over the lake, removing those nasty flying insects that we don’t like……………. 27 pairs (54 players) were lucky to have a lovely warm day with the course in excellent condition, and the fairways just starting to show a little green. A breeze to start with which was manageable, but became very strong for the later starters. But well done to the winners, who were near the end of the field. 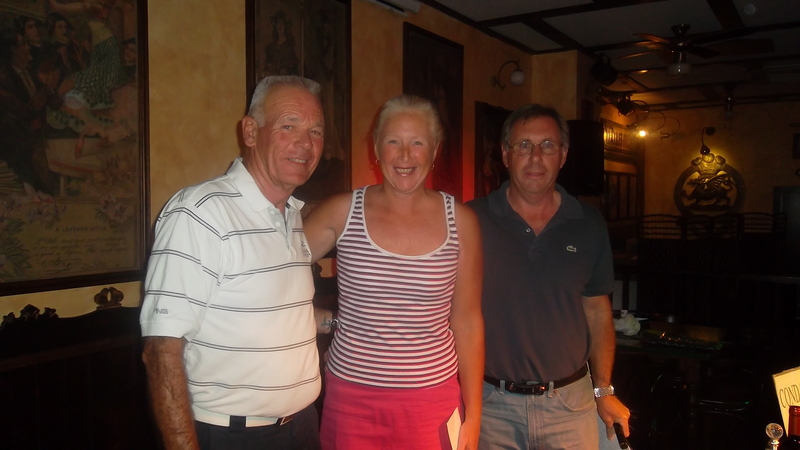 Photos of some of the winners………………. 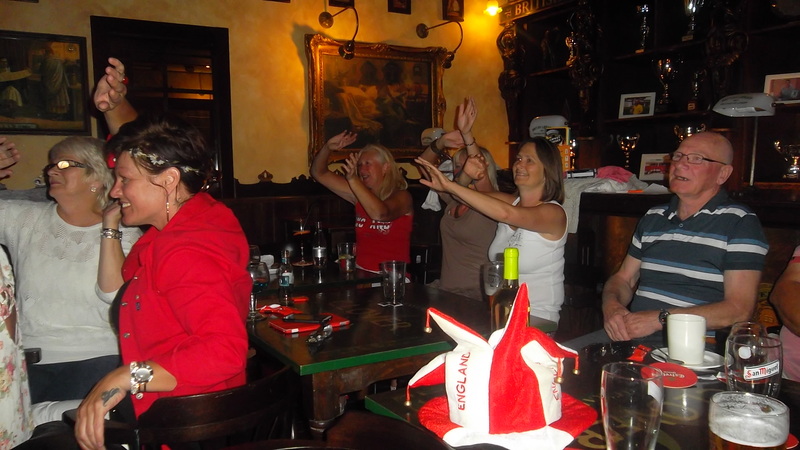 Kim and Alicia (foreground above) were given tokens of the society’s appreciation after they arranged their first night out as joint social secretaries. 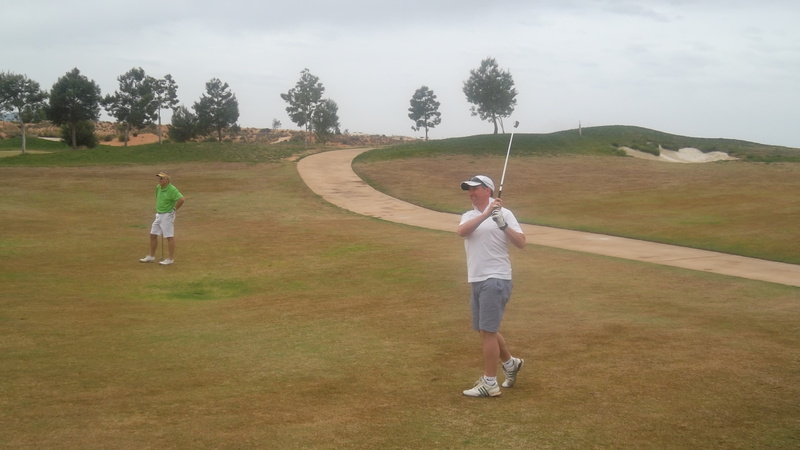 the irish guys left everyone trailing behind…..
Phil and Mick led early but had to settle for 3rd……. Alicia was nearest the pin……. 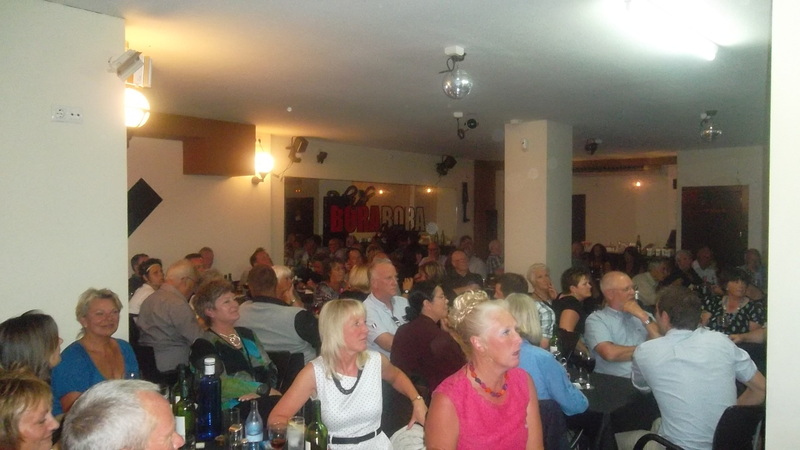 The evening presentation took place at Bora Bora, a new venue to us just to the right of the Bolnuevo roundabout, across the road from the Playa Grande hotel. and entertainment was provided by Scott James. Dave Lloyd added to the entertainment by performing on the pole which remains from the bar’s former existence as a pole dancing bar! no, it wasn’t a fireman’s pole……. 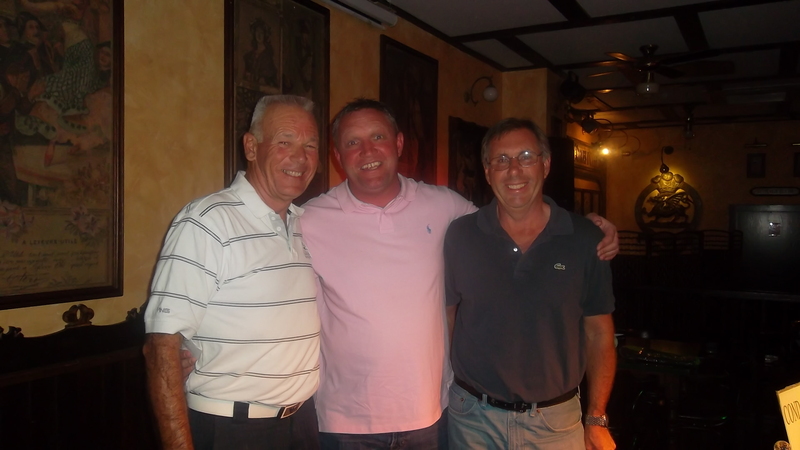 This week we feature not one but two golfers………………… myself and captain Paul Briggs played with two scots who we both know well. 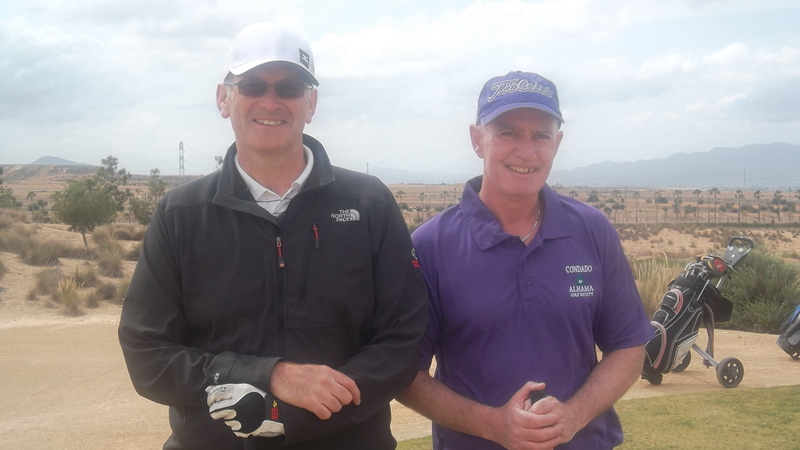 However, despite being regular visitors and members of the society, these two had never met before until they teed off on Friday morning. Somewhat of a surprise, as they live only a quarter of a mile apart in the same small town near Stirling, Scotland. They both live in the famous town of Bannockburn, where Stephen Pilley has lived for 22 years and Robert Beaton was born there! Stephen on the left, and Robert on the right……..
What’s the real reason your golf pro is always telling you to keep your head down? So you can’t see him laughing at you.